Education Qualifications: Minimum education qualification is 55% of marks at Master Degree level in relevant subject and NET! SLET OR Ph.D. Important dates : Application form submission will filled online. online form submission will be start from 03 march 2014 to last date 21 march 2014 any other mode of application will not be considered, detailed information and instruction are available on website. 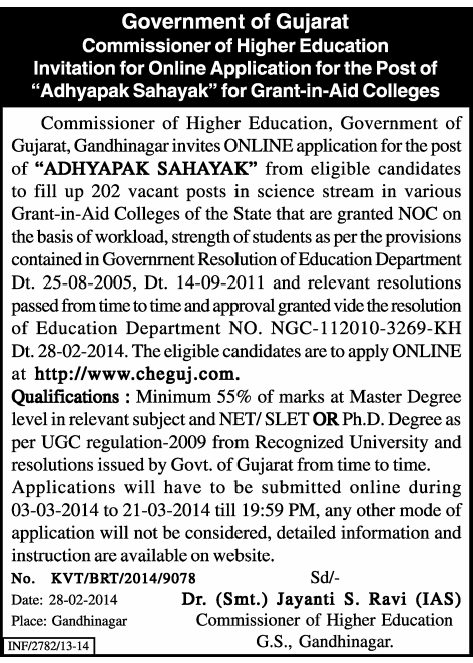 How to apply : The eligible candidates are to apply ONLINE at http://www.cheguj .com.